A 28-year old male was a restrained driver in a head-on motor vehicle collision. He was entrapped and extricated from the vehicle. Transient loss of consciousness was reported. He complains of severe chest pain, abdominal pain, and right upper leg pain. 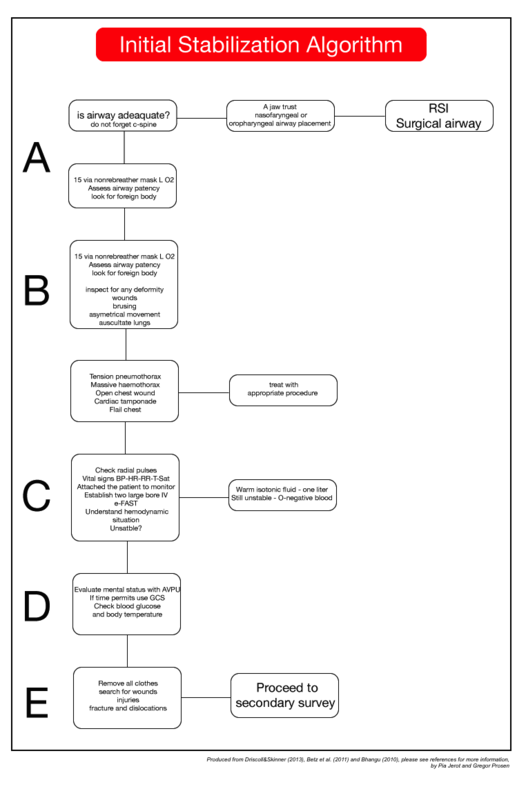 Multiple trauma patients are primarily stabilized by the ambulance crew on the field according to Prehospital Trauma Life Support (PHTLS) or International Trauma Life Support (ITLS) algorithm. This chapter is about the approach to multiple trauma patients in the resuscitation room and mainly focuses primary survey. The ambulance service has to provide information to the trauma center for the arrival of the seriously injured patient. The trauma team puts on protective clothing (rubber latex gloves, plastic aprons, eye protection, etc.). A team leader should brief the team and make sure that every member knows his role and all necessary equipment is ready. In the first few minutes, a primary survey has to be done. The primary survey is a structured assessment in which we identify and immediately treat conditions that are life-threatening. The primary survey should always be the same, following the ABCDE algorithm listed below. In case of massive external hemorrhage, “C” takes advantage over A and B. When the bleeding is controlled, we can continue with A and B. When the patient arrives at the trauma center, talk to the patient and quickly asses his consciousness and airway. If the patient is conscious and talking with a normal voice, his airway is adequate for a period. If it is obstructed, the airway has to be secured. While securing the airway, C-spine has to be protected, especially when we are dealing with a patient with neck pain, focal neurological signs, coma, suspected head injury or a history of high-speed impact. Do not delay C-spine and vertebra stabilization in a trauma patient with proper size of c-collar, side pads, and trauma board.. The airway can be temporarily opened with a jaw thrust or basic adjuncts such as nasopharyngeal or oropharyngeal airway. If the patient’s airway is still compromised, it should be secured by endotracheal intubation or surgical airway. Indications for endotracheal intubation are listed in Table 1. Intubated patients should be monitored by continuous capnography. All trauma patients should be given 15 L O2 via non-rebreather mask. The respiratory rate has to be evaluated. Expose the chest, and inspect for any deformities, wounds, bruising, asymmetrical movement or flail chest. The chest has to be palpated for any crepitus or subcutaneous emphysema. The lungs should be auscultated to assess the presence of breathing sounds bilaterally. Chest injuries that can impair breathing have to be identified and treated. Life-threatening thoracic conditions are tension pneumothorax, massive haemathorax, cardiac tamponade, open chest wound, flail chest. If any of those conditions are found, immediate action is needed. We can also use ultrasound at this moment to identify pneumothorax, haemathorax, and cardiac tamponade. The main objective of this step is to identifying shock situation in the patients. If there is massive external hemorrhage, it should be controlled before we proceed with A and B assessment. Radial pulses, heart rate and blood pressure (BP) should be assessed at that stage. The patient should be attached to the monitor. If we are dealing with a major trauma patient, at least two large bore (14G or 16 G) IVs have to be established. As an alternative, intraosseous line can be used. “Permissive hypotension” with systolic BP 80-90 mmHg should be maintained when bleeding is not controlled (internal bleeding). If the patient is hemodynamically unstable, fluid resuscitation should begin with 1 L of warm isotonic fluid, either normal saline or lactated Ringer’s. At this moment, it is better to keep in your mind that normal vitals are considered stage I shock which patients could lose up to 750 cc blood. So, starting fluid support to patients suspected multiple trauma is a standard approach regardless of their vital signs. If the patient is still unstable after 1 Liter of fluid or is having ongoing blood loss, we should administer a transfusion of O-negative blood and order type-specific blood. The patients who have an identified bleeding source will usually require surgical intervention. Do not delay surgery departments’ involvement. Internal bleeding in the thorax, abdomen, pelvis or around fractures of long bones (particularly femur) should also be evaluated. For identifying bleeding into abdominal, pleural, or pericardial cavities, we can use the bedside ultrasound (e-FAST exam). In the hemodynamically unstable patient with normal e-FAST, one should think pelvic injuries. What is your opinion about eFAST sample below in a patient with trauma and hypotension? In the primary survey pupil size, symmetry and reactivity should be assessed. To detect the level of consciousness, the patient has to be assessed by AVPU scale. It stands for A: Awake, V: responds to voice or verbal commands, P: responds to painful stimuli, U: unresponsive. If there is time, Glasgow Coma Scale (GCS) can be used to assess the level of consciousness. Otherwise, GCS is assessed in the secondary survey. GCS is listed in Table 2. And finally, patients should be evaluated for any lateralized motor deficits which motor part of the GCS may help for this. An important clue, the patients can not move their extremities because of focal injuries. In this stage, blood glucose and body temperature should also be checked. All clothes have to be removed from the patient so that hidden injuries and bleeding can be identified. The patient has to be log-rolled. In a log-roll, back of the head, neck, posterior chest, lower back should be inspected, palpated and auscultated as appropriate. If necessary, the rectal examination can be applied at this moment. We have to avoid hypothermia during this stage. The secondary survey can be done after the primary survey and when the patient is responding to resuscitation. It consists of taking history (see “SAMPLE” mnemonic below), head to toe assessment (including log-roll), interpreting results of investigations, formulating a management plan for the patient and documenting all findings. A: Airway obstruction caused by c-spine injury, foreign body, etc. 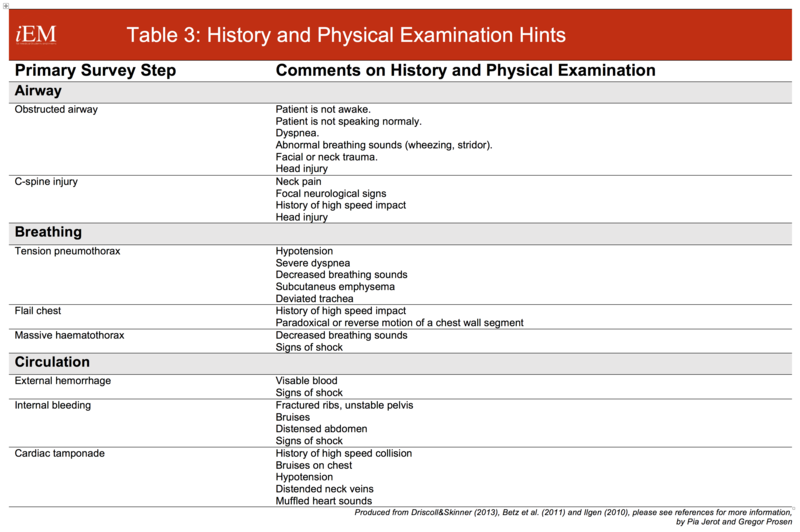 History and physical examination hints to help “rule in or rule out” differential diagnoses are listed in Tables 3. As an example, any patients with head, neck, facial injury or having abnormal breath sounds should be suspected of an obstructed airway. Any patients with severe shortness of breath, decreased or absent breath sounds on the lung, and hypotension is a tension pneumothorax until proven otherwise. Laboratory evaluation of the trauma patient is used for assessing the adequacy of resuscitation, for determining the proper transfusion products and the onset of coagulopathy and for baseline values for follow-up studies. When IV access has been established, 20 mL of blood should be taken for a full blood count, urea, electrolytes and for blood group type or full cross-match. An arterial blood should also be taken for blood gas and pH analysis, but it can be taken at the end of the primary survey. If there is a very limited amount of blood taken, blood group type and cross-match should be the only test for the patient. The e-FAST (Extended Focused Assessment with Sonography for Trauma) should ideally be a part of the primary survey, especially for unstable patients. It can be used for evaluating pneumothorax, free fluid in thorax and abdomen and to identify cardiac tamponade. What is your diagnosis and next action for a trauma patient with below eFAST view? A trauma patient should be radiographically evaluated with chest and pelvic radiographs. C-spine X-ray was traditionally used. Nowadays, any low-risk criteria violation is considered for computerised tomographic evaluation for the cervical spine. Cervical spine imaging can be delayed if there are no neurologic findings or persistent moderate hypotension. For assessing C-spine and other injuries, CT scan is the best choice in the acute setting, when the patient is stable. What is your diagnosis and next action for a trauma patient with below CT scan? Imaging studies of the thoracolumbar spine and extremities can be delayed until higher priority assessments and interventions are complete. Initial stabilization should be done during primary survey. The algorithm is shown in Figure 1. The goal is every abnormality detected during the primary survey should be fixed. 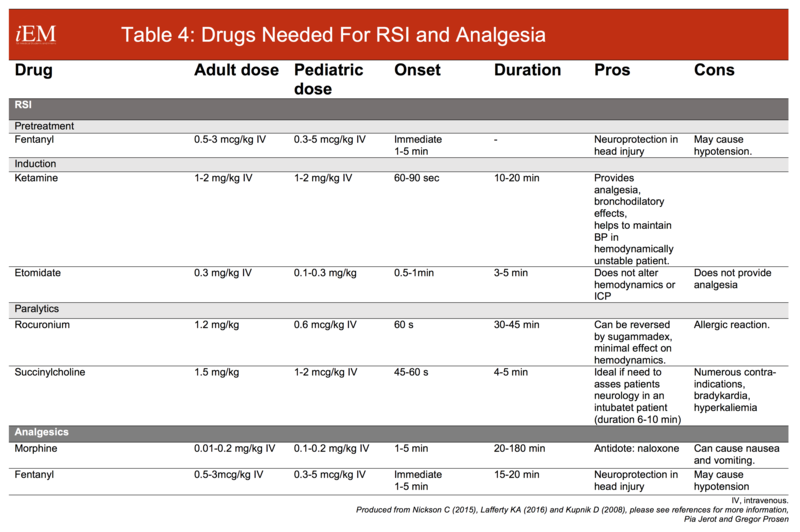 For RSI, you will need a pretreatment agent (mainly fentanyl), induction agent (mainly ketamine or etomidate) and paralytic agent (mainly rocuronium). Dosages and characteristics of drugs are listed in Table 4. Doses must be adjusted in the hypotensive or shocked patient. For analgesia, opioids or ketamine can be used. Dosages and characteristics of drugs are listed in Table 4. All procedures for initial stabilization should be done in the primary survey. Airway: If the patient’s airway is compromised after a jaw thrust, nasopharyngeal or oropharyngeal tube placement, then orotracheal intubation is indicated. Rapid sequence intubation should be done. If it is unsuccessful, the surgical airway should be established. Breathing: If tension pneumothorax is found in the primary survey, it should be decompressed immediately. Tube thoracostomy should be followed this procedure. If massive haemathorax is found, thoracostomy should be performed. However, in this situation, please make sure that the patient was supplied with enough volume and blood. Informing trauma surgery or thoracic surgery for potential thoracotomy risk is a wise approach. Circulation: If massive bleeding is found, it should be controlled immediately. If cardiac tamponade is found, it should be treated with pericardiocentesis. Airway: Airway should be checked the same as in an adult patient. When positioned flat on a stretcher, the occiput can flex the neck and the floppy upper airway which can result in occlusion of the airway. To prevent this, place a pad under the torso of children younger than eight years. Breathing: Normal respiratory rates vary in different ages. Newborn respirates 25-50 breath per minute while 6 months to 12 year kids respirate 15-30 breath per minute. Circulation: Brachial and femoral pulses are usually easy to feel. A weak, rapid pulse with a rate over 130 is a sign of shock in children all ages except neonates. Children have a strong compensatory mechanism in early shock and later deteriorate very quickly. When giving fluid resuscitation, give 20 mL/kg in each bolus. Disability: When evaluating an injured child, the care provider should remember that children of various ages have different cognitive skills and interact differently. For assessing child`s neurological status, special GCS is used. The geriatric patient should be assessed and treated by ATLS protocol for adults. Because of multiple comorbidities in this age group, the patients may need special considerations such as medications which affect vital signs and basal laboratory results which affect the decision on imaging modalities (high kidney functions). However, life-threatening situations have priority, and immediate actions should be taken as with normal adults. Primary survey is the same for the pregnant patient as for other patients. The normal heart rate of a pregnant patient is 10-15 beats faster than usual, and the blood pressure is 10-15 mmHg lower; so, normal vital signs can be mistaken for a shock. A blood loss of 30-35% can occur before there is a significant fall in blood pressure. The majority of patients will be admitted to the hospital following major trauma for the management of their injuries. Some of them need operation while other just need observation. Admission criteria for ICU are cardiovascular resuscitation, airway protection and mechanical ventilation, invasive monitoring, severe head injury, organ support and correct coagulopathy. The discharge decisions of trauma patients differ between institutions and systems. However, below list are cover the general agreement about the patients who can discharge after trauma. Minor blunt trauma, hemodynamically stable on serial assessments. Negative e-FAST and CT scans for free fluid in body cavities. Minimal head injury with GCS 15 and normal CT scans without other body injuries and with normal neurologic status (with instructions to return for any changes in mental status, vomiting, or worsening headaches). Uncomplicated rib or sternal fractures. Multiple trauma patients who do not need admission for opetaion or observation are usually referred to a surgeon for the follow-up or management of their injuries. Driscoll AP, Skinner VD. Initial Assessment and Management: Primary Survey and Resuscitation. In: Driscoll AP, Skinner VD, editors. ABC of Major Trauma, fourth edition. Oxford: Blackwell Publishing Ltd; 2013: 1-7. Bhangu A, Lee C, Porter K. Principles of trauma management. In: Bhangu A, Lee C, Porter K, editors. Emergencies in Trauma. New York: Oxford University Press Inc; 2010: 3-11. Betz ME, Tibbles CD, Rosen CL. Initial approach to trauma. In: Legmone E, Shockley LW, editors. Trauma: a comprehensive emergency medicine approach. Cambridge: Cambridge University Press; 2011: 1-9. Ilgen JS. Trauma in Adults. In: Tintalli JE, editor. Tintinalli’s Emergency Medicine. New York: McGraw-Hill Companies, 2010: Chapter 156. Bailitz J, Bokhari F, Scaletta TA, Schaider J. STABILIZATION: Airways, Breathing and Circulations (ABCs). In: Bailitz J, Bokhari F, Scaletta TA, Schaider J., editors. Emergent Manegement of Trauma. New York: The McGraw-Hill Companies, Inc; 2011: 11-12. Gross EA, Martel ML. Multiple Trauma. In: Marx JA, Hockberger JS, Walls RM, et al. Rosen’s Emergency Medicine: Concepts and Clinical Practice. Philadelphia: Saunders, an imprint of Elsevier Inc; 2010: 287-295. Kupnik D. Zdravila v nujni medicini. In: Grmec Š. Nujna stanja. Ljubljana: Macula Lunea, 2008: 447-470. J Trauma Acute Care Surg. Pediatric Trauma. In: J Trauma Acute Care Surg. ATLS-Advanced Trauma Life Support. Chicago: American College of Surgeons, 2008: 246-270. Fernandez J, Rifenbark M. Trauma Principles. In: Schindlbeck MA, Sherman SC, Weber JM, Patwari RG, Clinical Emergency Medicine. New York: McGraw-Hill Education; 2014: 358-362. Schindlbeck MA, Sherman SC, Weber JM, et al. Clinical Emergency Medicine. New York: McGraw-Hill Education; 2014.